Beginning in the 1950s, the U.S. Department of State sent dozens of America’s greatest jazz musicians to tour the globe becoming known as “the Jazz Ambassadors.” Recognizing the cross-cultural appeal of jazz, American Jazz Ambassadors were able to transcend national boundaries, build new cultural bridges, and tell a larger story about freedom in America. From the 1950s to the 1970s, jazz took the world by storm in response to popular jazz broadcasts such as Willis Conover’s Voice of America radio show, Music USA. The U.S. Department of State sent America’s greatest jazz musicians—“The Jazz Ambassadors—touring worldwide. These remarkable American jazz musicians were enthusiastically welcomed from Africa to the Middle East, Europe, Asia and Latin America. 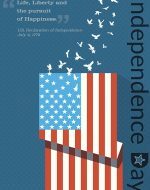 The U.S. marks its Independence Day on July 4, the day in 1776 when founding fathers approved the Declaration of Independence. Download your choice of PDF files of this free poster today!